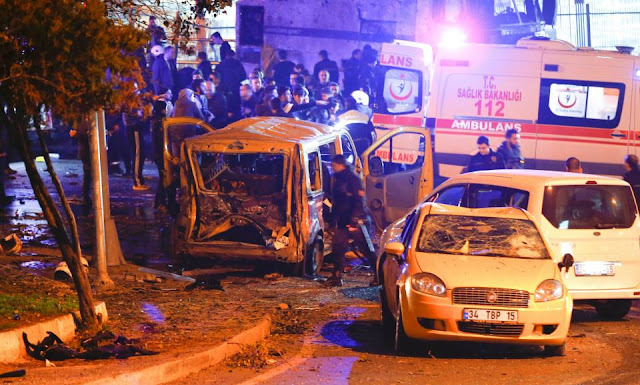 Nearly Twenty nine people were killed, in which 27 are police officers and 2 civilians, also 166 people were wounded in twin bombings that bang Istanbul on Saturday after a home football match hosted, according to international media reports. Already 10 suspects were been incarcerate over the bombing. The first bomb blast was caused by a car bomb that struck outside Besiktas's football stadium. Followed an another attack after 45 seconds at nearby Macka Park, carried out by a suicide bomber who roar himself up in the midst of police officers. President Recep Tayyip Erdogan said in a statement that the blasts shortly after the end of the match seek to cause maximum loss of life. We have witnessed once more here in Istanbul the vile face of terror attack which trump down any form of value and morals.